My first published story detailed a disastrous sleigh ride culminating in having hungry wolves eat one of the passengers. But I won an award in our high school “literary” magazine, a poorly mimeographed collection of papers which were stapled together crookedly. Even so, the spark of possibility was lit within me. I continued to write for any and all takers. I had a regular column in the Muncie (IN) Star while I attended Ball State University. After college, I edited a weekly newspaper, sold advertising, did freelance work, worked in public relations and as a corporate speech writer. I couldn’t quite figure out how to write a novel. Maybe because I was selling my non-fiction, and I couldn’t take the time from it to try fiction? Beats me. Finally, while I was working as a motivational speaker—a motivational speaker with book-length handouts—I heard about a call for personal essays. They were to go in the second book in a new series called Chicken Soup for the Soul. By then, I was married with a young and incredibly active son. No way could I give up my lucrative speaking career to write a novel, but I could knock out a few personal essays. Which paid nothing. But might be good publicity. I wound up writing five of the Chicken Soup for the Soul stories, plus one that was turned into a program for the PAX TV Network. I never saw a dime from those essays, but you know, it was the best experience because it revived my sense that I was, indeed, a writer. When Simon & Schuster requested book proposals from speakers for a new series, I was ready. That’s how my book Using Stories and Humor: Grab Your Audience (ISBN: 020526893) came into existence. We’ve sold more than 10,000 copies and the rights to Taiwan. A body in motion tends to stay in motion. I followed that with nine other non-fiction books, including seven on scrapbooking. But I wanted to write a novel. To create unforgettable characters. To make people laugh and cry and think. From that one sentence sprang my protagonist Kiki Lowenstein, a woman who’s only ever been good at two things in life: scrapbooking and getting pregnant. When her husband is found dead, under suspicious circumstances, Kiki decides she's the perfect person to investigate his murder. After all, she's a mom--and moms are invisible, right? Kiki uses her knowledge of scrapbooking to learn more about her husband's secret life. Unfortunately, her snooping around puts her squarely in the path of a serial killer. Can a slightly overweight soccer mom with no self-confidence save her own life? You'll have to read Paper, Scissors, Death to find out. Kiki’s the star of Paper, Scissors, Death (IBSN: 0738712507) which will debut September 13, 2008, from Midnight Ink. It’s the first book in a series. Included are recipes and scrapbooking tips. Anyone who pre-orders the book will have a chance at being a character in Book #2. Just email Main Street Books of St. Charles (MO) at msbstchas@sbcglobal.net. (Or call at 636-949-0105.) The proprietor, Vicki Erwin, is keeping track of all the purchasers' names. 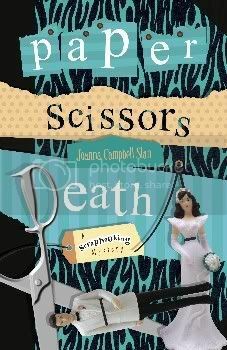 To see what reviewers and early readers are saying about Paper, Scissors, Death, or to learn more about scrapbooking and public speaking, go to www.joannaslan.com. You might also enjoy the blog I share with other mystery authors who write about hobbies. Go to http://killerhobbies.blogspot.com.